The Parc des Sports Marcel-Michelin is a stadium located in Clermont-Ferrand, France. It was inaugurated in 1911 and belongs to the rugby union club ASM Clermont-Auvergne. 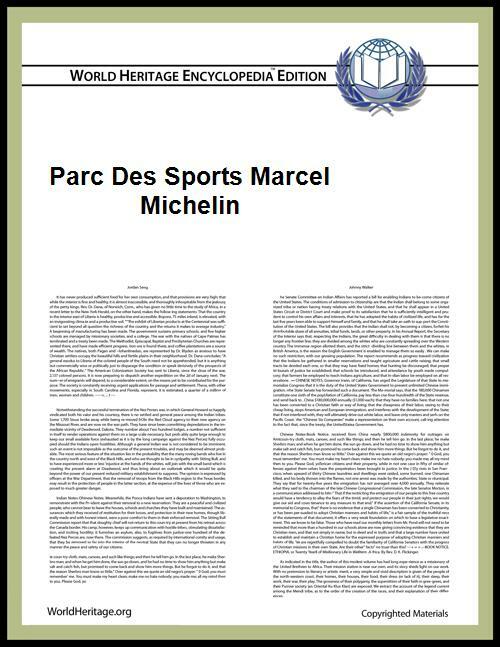 It has the name of Marcel Michelin, manager of the Michelin tire group and founder of the sportive association "Association Sportive Michelin" (ASM). Then it has been renamed AS Montferrand, and ASM Clermont-Auvergne for the rugby department. Even if it’s the property of the ASM Clermont-Auvergne club, it was built on a plot rent as part of an emphyteutic lease (a type of very long term rent, it’s often 99 years) which belongs to Michelin tire firm. In 1911, the tire manufacturer Michelin finances the construction of a rugby pitch on the initiative of its manager Marcel Michelin. This one takes its name from Stade Marcel-Michelin and hosts the Rugby union club AS Michelin’s games. 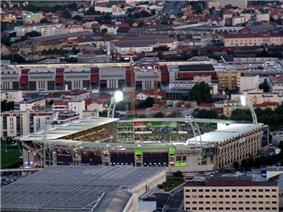 This stadium is located in Clermont-Ferrand in the city centre on the “Avenue de la République”. It’s the property of ASM Clermont-Auvergne (France Champion 2010) and hosts every club’s home-games in Top 14. (Equivalent of the Premiership). It has also hosted a few international games (France vs Romany in 1977; France vs Australia in 1983) and the World Cup final U21 of the Rugby Union, celebrating the victory of France. The players could read a sign indicating the number of victorious games on this pitch at the way out of the dressing room. The 1000th won game in the elite for 1925 was (reached) on December the 16th 2006 against the Arix Viadana (57-29) in European Challenge. In 2011 a new sign indicating “Here… 100 years of history” was set up in honour of the club’s Centenary. The Marcel-Michelin stadium boasts the “Brennus” during the match against CA Brive at the beginning of the season 2010. The alternation of the blue and yellow colors is used during the big Europeans games, and also for the purpose of demonstrations for the televisions channels. The Michelin’s atmosphere is traditionally respectful of the rugby’s values. The trophy of the “best public” has been awarded three times to the stadium in 2007, 2008 and 2009 during the “Rugby Night”. During the championship rugby season 2010-2011, an extension of the rugby stadium has been built. Two giant screens are operational since March 2011. The stadium had 18 030 seats for the season 2011-2012. The stadium has commercial premises on site (banks, opticians, brewery, temporary employment agency, the club shop, restaurants and fast food). The stadium is served by public transit (bus stop Marcel-Michelin). In August 2012, the president announced a possible extension of the stadium of 21 000 seats for the coming seasons. During summer 2013, The ASM rugby club laid a heated artificial pitch, the first of the TOP 14 (French rugby championship): the lawn has low-voltage electrical cables running through it which allows a heating even 25 cm under the ground. The first step must be the north stadium stands (called Philiponneau) and removal of the part where there are no seats. The stadium has got 4 terraces connected by corners. Two of them are longitudinals : « Volvic » the oldest one, and « Auvergne » . The other ones are « Phliponeau » and « Edouard » (a restaurant since 2012 and «in goal area» is in the bottom of Edouard's terrace) historically the Volvic terrace was built first. The Auvergne terrace is the biggest with more seats than the other. The Phliponeau terrace is the one of supporters like « UltraVulcans » and the « Vignerons ». The Marcel-Michelin stadium boasts the “Brennus” during the match against CA Brive at the beginning of the season 2010. The alternation of the blue and yellow colors is used during the big Europeans games, and also for the purpose of demonstrations for the televisions channels. The Michelin’s atmosphere is traditionally respectful of the rugby’s values. The trophy of the “best public” has been awarded three times to the stadium in 2007, 2008 and 2009 during the Rugby Night”. The best public trophy has been awarded 3 times to the stadium during the night of rugby in 2007, 2008 and 2009. Moreover in 2012 the public received the award of the best European public. In the middle of the Auvergne terrace (East), along the stadium there is a commemorative plaque in tribute of the death of the rugby player Jean-François Phliponeau who died from a lightning strike during a rugby match.